Pooh's Den: The weekend that was! V enjoys cooking and baking and on Saturday V put on her chef’s hat and started experimenting. New recipes off blogs gave way to everyday Indian food with a twist. Dips and cheesy spreads that usually are not a part of our meal at home were made. Tex-Mex favorites in a healthier, no cheese and sour cream version were prepared. Mango being the fruit of the season took the honors in the form mango kheer and mango lassi. Bliss! Fine-dining at home! We headed out early Sunday morning to High Island for some bird photography. This was my first time at High Island and the place is absolutely divine. I never knew such a place existed near the concrete jungle aka Houston I call home. There were hundreds of Egrets, Roseate Spoonbills, Cormorants, Ibises, Tri-colored Herons around the lake. R has captured some great pictures. Do drop by his blog he’ll load the pictures there soon. And if you have not been with R on one of his photo trips well check out the pictures. 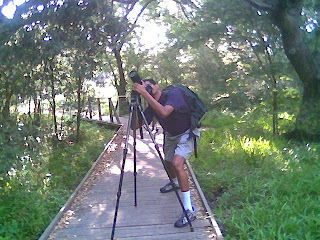 R with his big lens, tripod and the backpack is indeed something to look at. R goes to a different world when he is photographing. He talks to himself (he’ll deny that), draws figures in the air (another denial) and is oblivious of his surroundings. 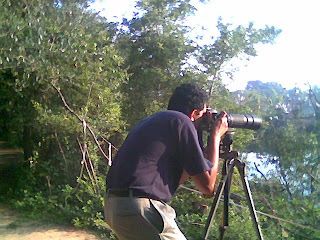 Check out some pictures from V’s camera phone, capturing R unaware as he clicked away. High Island is a small village some 80 miles south of Houston and is just another dot on the map. The place is called High Island due to some salt deposits underneath that make the area higher than the surrounding places. There are some man-made lakes where migratory birds nest and are a wonderful sight. We ended up at the Smith Oaks Sanctuary in High Island to discover the gates to be closed and we went around trying to find the other entrance to the park and bump into not 1 or 2 but hundreds of vultures on a vacant field. We stopped on the road and clicked some pictures of those great birds and believe me they are ugly. Good food, a wonderful trip and what follows is nothing but sleep. Weekends are meant for lazy afternoon siesta, naps whenever you feel like and more naps. We did just that. We did do some chores around the house, washed the cars, did some shopping, people watched at the Village enjoying ice-creams, watching parts of the NFL draft, Iron chef America, bits and pieces of Kovai brothers, Mujse Shaadi Karogee and Yejaman (we still have to learn how to be patient enough to watch a movie). R did head out to work for a while and V went for her dance classes, caught up with the gals and did what gals always do – Gossip! And here we are Monday morning and wishing for the weekend again! Looks like tha weekend was wonderful ! Gals, gossip, cooking, snaps on tripods interspersed with good advice on eco-friendly life ! What more ! Well, actually if Monday morning can be slightly delayed...! yeah that would have been nice. Well atleast you get this Tuesday off. Unfortunately for V and R they have to slog out too! Hi Vinita.... I read through your posts. Really wonderful and very well written.. Enjoyed reading every bit of it... Looking forward for many more from your side. WOW! makes me want to go to the Long Island.. where exactly is it and how to I get there? It is High Island. It is on I-10 east towards Beaumont, off 124 close to a small town called Winnie. You can also access High Island from Galveston.